Filming 'Mio in the Land of Faraway' co-produced by companies from Sweden, Norway and the Soviet Union. In the shot, Nicholas Pickard starring as Mio, Christian Bale as Yum-Yum, 1987. Do you know that ‘Mio in the Land of Faraway’ was the film debut of Christian Bale, that ABBA wrote the movie’s score, and that the special effects were designed by the art director of ‘Batman’ and ‘Aliens’? 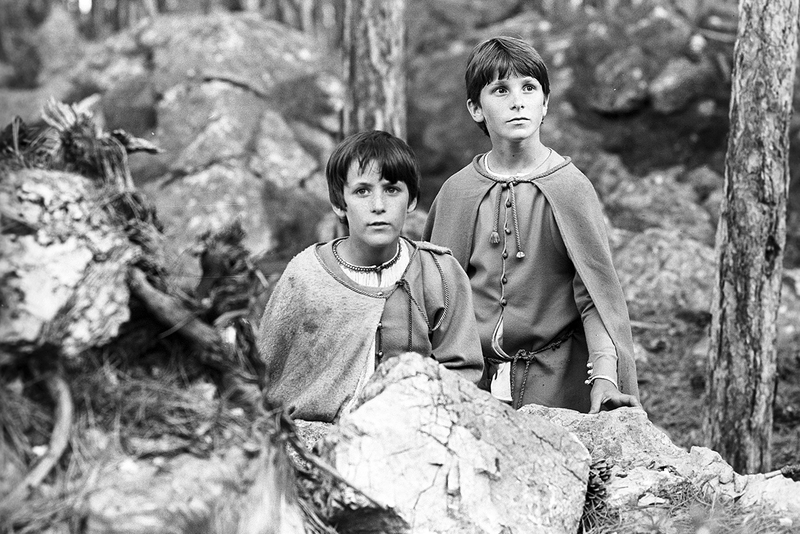 This March marks 30 years since Soviet director Vladimir Grammatikov filmed the fairy tale Mio in the Land of Faraway starring young Brits Nick Pickard and Christian Bale as the main characters. The film’s Swedish producers wanted a Soviet director to film the screen adaptation and chose Vladimir Grammatikov after being impressed by his melodrama A Dog was Walking on The Piano. The director met Lindgren, the famous story writer, at her home but instead of talking about the film they spoke about his childhood. Satisfied by his answers, Lindgren approved him as the movie’s director. Members of the legendary Swedish foursome ABBA Benny Andersson and Bjorn Ulvaeus wrote the soundtracks to many Swedish films after the band’s breakup. But it is ‘Mio My Mio,’ performed by Gemini, that became a hit in Sweden and Europe. Grammatikov wanted Soviet children to play the main characters but he couldn’t find any bilingual kids who were suited to the lead roles, so the director started looking for candidates in London theatre schools. Agents videoed 260 children, 70 of whom were selected for auditions. In the end the role of Mio was given to Nick Pickard and Jum-Jum was played by Christian Bale, his first film role. Thirteen-year-old schoolgirl Elena (Lena) Stupakova, who was a member of a climbing club, performed the young British actor's stunts. At first the director didn't want a girl to double for the boy, but he changed his mind when he saw that Lena looked like Nick and that her command of the sword, needed for the scene of the final battle, was impressive. The idea of inviting British actor Christopher Lee (Wizard Saruman in The Lord of the Rings) to play the evil knight was the film's producers. Lee came to Moscow for the first time and met the director at Gorky Studio where the film was being shot. Grammatikov told Lee about the importance of the final scene in which "the villain wants to renounce evil". Lee liked the challenge and agreed to the role. Crimea was chosen for shooting the outdoor scenes. But the infamous accident at the Chernobyl nuclear power plant meant the foreign producers were afraid to travel to Crimea because of the radiation. The project was on the point of being closed down when Grammatikov found a former president of the International Atomic Emergency Agency (IAEA) in Yalta, who agreed to take water and air samples to prove that there was no radiation in Crimea. This was how the foreign actors and crew were lured there to continue shooting the film. Crimea’s scenery and locations became the Land of Faraway in which Mio ends up and where he finds his father and his friend Jum-Jum. For example, the Swallow's Nest castle, Nikitsky Botanical Garden, and the Vorontsov and Livadia palaces feature in the film. British art director Terry Ackland-Snow was responsible for the special effects, and Konstantin Zagorsky was the production designer. The latter, in particular, came up with the set design for the cave where the protagonists come to fetch the sword to defeat Kato. The set design was strikingly naturalistic but it turned out to be so heavy that, when it was being dismantled, a tank was needed to move it out of Gorky Film Studio, according to Grammatikov. The original version was filmed in English and local actors dubbed it for the Soviet and Swedish versions. The main song was recorded in three languages but it was not included in the Soviet version. There are also discrepancies in two of Mio and Jum-Jum's dialogues: In the house of Millimani's mother when Mio asks his friend whether his father knew that Mio could die in the battle with Kato, and in the cave, when the boys find each other by playing flutes.